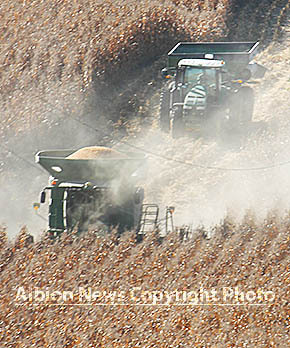 With good drying weather over the past weekend, area farmers were harvesting both soybeans and corn at a rapid pace. Early this week, soybean harvest was estimated at 70 to 75 percent complete, with corn harvest at 30 to 35 percent complete. Excellent yields were reported, but strong winds on Monday caused some corn to lodge. USDA is forecasting record corn and soybean production in Nebraska.